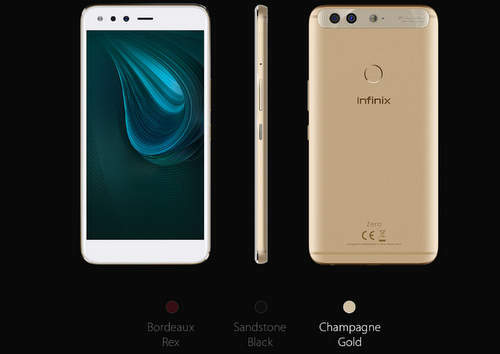 Infinix Zero 5 android phone was released in November, 2017. The smartphone display features a 5.98 inches FHD IPS touchscreen with 16 million colors and 1080 x 1920 pixels resolution. Its dimensions are 166.38 mm x 82.38 mm x 7.95 mm (height x width x thickness) and weighs 197 g.
Infinix Zero 5 is powered by an Octa-core 2.6GHz processor with a MediaTek Helio P25 chip-set. MediaTek Helio P25 was launched in 2017 having a 64 bit octa core arm LTE Soc. It is built on 16 nm FinFET process having Mali-T880‎ GPU. The new Tecno Phantom 8 also comes with this chip-set. Infinix Zero 5 comes with two variants 64 GB or 128 GB of an internal memory on 6 GB RAM which can be extended up-to 2TB via microSD card. It comes with Android 7.0 Nougat (with XOS V3.0) that is powered by a Li-Ion 4350mAh non-removable battery. 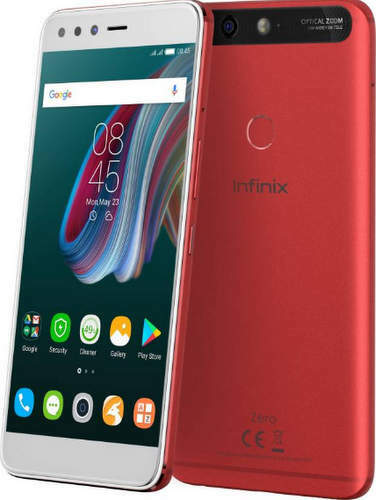 Infinix Zero 5 camera comes with a single LED flash Dual 13 -megapixel and 12 -megapixel rear camera on the back with with 10x digital zoom and 2x optical and a 16-megapixel front camera with 1 flash LED for selfie. It has a Dual SIM slot (GSM and GSM) which accept micro-SIM for both slots. Connectivity includes Wi-Fi, Bluetooth, GPS, USB,3G, 4G and LTE networks(Global Support). Sensors on the phone include Ambient light sensor, Proximity sensor, Accelerometer, and Gyroscope.